Read here for the differences between Beginner or Amateur versus Professional Clarinet Articulation. The start of any clarinet sound is TOO HARD. Every note starts with an extremely hard attack. BAM! FLICK! POW! CRASH! THUD! - Like a cannon shot - Like a firework exploding. An explosion or burst of sound starts the sound. DUHT! DUHT! DUHT! DUHT! That is the sound of quarter notes or eighth notes. Your tongue is working too hard both at the beginning and end of each note. Also, you put daylight or breaks in the sound between every single note (even when it calls for legato articulation). Often, it is not just the tongue working too hard, but the chin is chewing while you articulate. If you wish to articulate fast, imagine a large tongue movement, a large chin movement and then trying to speed this up. Do this, think of having a piece of chewing gum in your mouth. Now, chew it as fast as you can. Hopefully, you wish to articulate on clarinet faster than that. CHEWING WHILE YOU ARTICULATE IS INCORRECT. 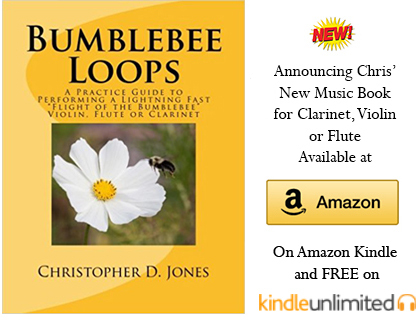 Listen to the start of the sound of a top professional clarinetist. When they start the clarinet sound, it is SOUND. It is clarinet sound. Not, POW! and then sound. You cannot hear a FLICK! then sound, THUD! then sound, you get the picture. They can release the air over the reed and make the sound vibrations happen without a bump. Even if a top clarinetist follows a composer’s wish for an accented note, the breath accent still starts only with SOUND. While hearing a top professional clarinetist articulate a series of notes (repeated pitch or scale/arpeggiated pattern), it is incredibly light and smooth. The articulations are even and sound the same both rhythmically and matching among the different notes. When you hear this miracle, think of this, is the tongue working hard, or is it working lightly and close to the reed? Watch a bad conductor. If they wish to speed a piece of music up, they get bigger with their arm-flapping motion. Well, this is opposite of what they should do. They should conduct with smaller motions to speed up the music. Now, apply this to your tongue. If you wish to speed up your articulation, learn to move the tongue with small, light motions. For the top professional clarinetist, articulation is only part of the greater MUSICAL picture. They know how to work the embouchure, air speed, tongue motion, tone quality and the meaning behind the music to make it all sound RIGHT. The top professional clarinetist has done hours and hours of practicing building and maintaining a good, quality, light articulation. Not only do they practice honing the skill of the embouchure and tongue, but the coordination of the tongue with the finger technique. In order for them to keep this skill, they still have to practice and MAINTAIN this articulation achievement. Yes, today, the great clarinetists that you admire more than likely did some form of clarinet articulation maintenance today. Did you? That is one key to gaining professional clarinet articulation. On clarinet, if you don’t practice, ARTICULATION is the first thing to go. HOW DO YOU MOVE FROM AMATEUR TO PROFESSIONAL CLARINET ARTICULATION? 1. Learn how to start the sound properly. 2. Learn how to repeat the articulating, light, stroking motion of the tongue on the reed. Remove any chin motion and/or large tongue motion. 3. Start slowly with a metronome to begin an articulation maintenance routine. Concentrate mostly on LEGATO articulation. 4. Practice articulation daily to build good endurance, speed and evenness of sound.